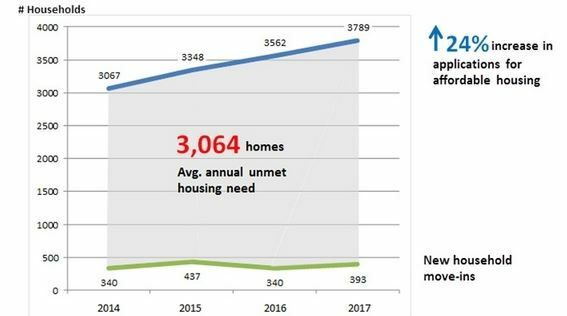 Applications for affordable housing to Avesta Housing, the largest nonprofit affordable housing provider in northern New England, have gone up by 24% since 2014, but the availability of housing for low-income renters has gone down, the organization said Thursday. The company’s 2017 Affordable Housing Activity report shows a widening gap between how many families have applied for housing, and how many received it. The company received 3,784 applications in 2017 and had 393 move-ins. It’s waiting list has 1,594 individuals or families. A report last year by the National Low Income Housing Corp. determined that Maine had 46 units available per 100 “extremely low income” renters. ELI renters are defined as at or below either the poverty line or 30 percent of the area median income can live without spending more than 30 percent of their household income on rent and utilities.